Picture from fieldoptic : The rocky upper part of Cashel Hill is good for some clambering. Picture: The rocky upper part of Cashel Hill is good for some clambering. Parking at the church at L80291 42396 C you can pass through the gate to the left side of the church as you face it, up the slope. This boithrín leads to the graveyard at L80714 42976 D. The graveyard contains the easily discernible circular ditch of the original caisel or ringfort that gives the hill and townland it's name. To the north of the graveyard through a gate is a maintained holy well. Passing the graveyard on your right hand side you can go through a gate onto open ground and the hill rises away to your left. The lower slopes are easily traversed being grassy but there's a decent rocky clamber to the top. Views are excellent in all directions with the full southern flank of the Bens laid out before you, Lissoughter and the Maams, Roundstone bog, Errisbeg, and the bays to the south, all beautifully arranged. This is also fantastic spot to watch a sunset over the lakes of Roundstone Bog or the Bens if you're properly equipped with torches for a descent in the late dusk. 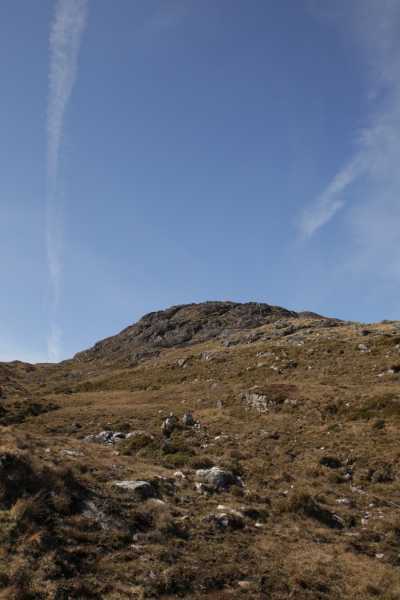 For extra interest, though out of the way of the best route there is one of the surprisingly few megalithic sites in Connemara on the SE flank of the hill at L79279 43217 E, a wedge tomb, well preserved.